How many of you are true curry lovers? I love curries that are made thick with loads of spices. My chicken and mutton curries must have the most spices because they can simply make your curry really aromatic and super delicious. But of course not over the quantity needed. I am Swasthi , the writer at Indian Healthy Recipes. Currently I am a stay at home mum to 2 kids aged 9 and 2, living in Singapore. 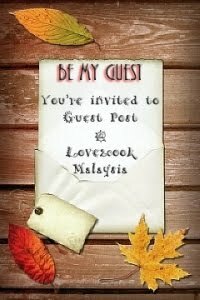 I am happy to be a guest on Love’s space for her "Guest Posting @ Love2cook Malaysia”.Thanks a ton dear for giving me this opportunity. I have known Love from the initial days of my blogging. I know her as a cheerful, very lively lady and a wonderful cook and we have been visiting each other’s space often. Today I will share with you all a popular recipe Andhra Chicken Curry| Kodikura. Just like each state has a different and unique version of chickencurry, even region has a different version of making this dish. Today iam going to share a special Andhra Chicken Curry recipe that is mostly prepared in the coastal regions of Andhra Pradesh, where coconut is an integral part of their dishes. 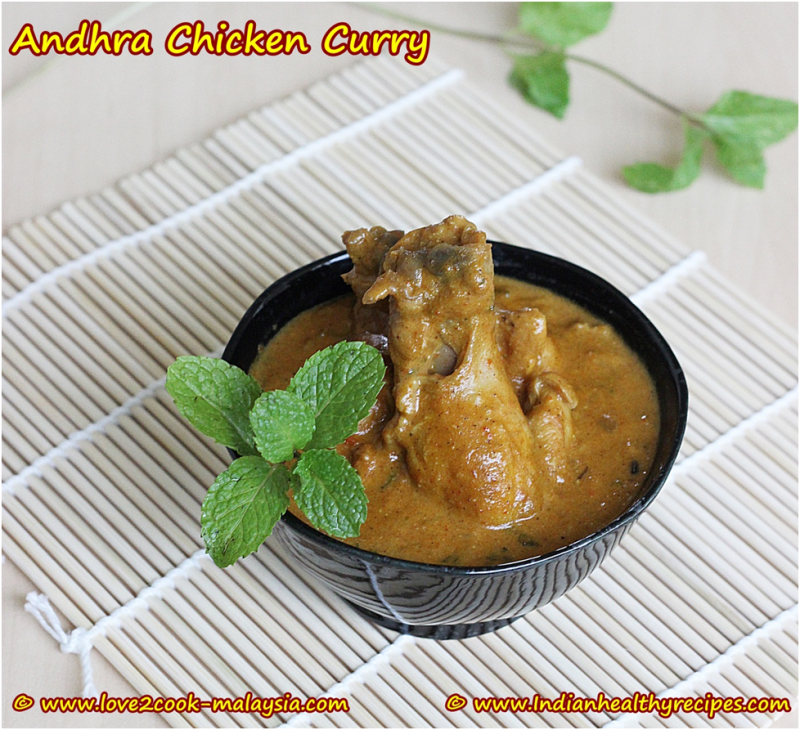 This is very much different from the simple Andhra Chicken Curry | Kodikura that is posted in my blog HERE. 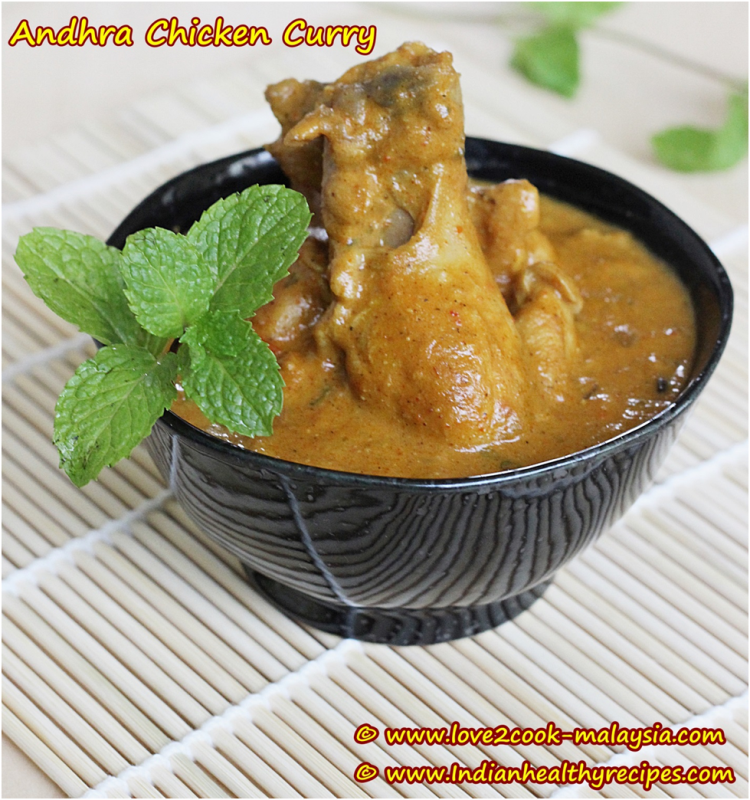 Try this and am sure you will say this is one of the best Andhra chicken curry you ever had. Are you wondering what is so special about this curry? It is the browned onions that give a different smoky flavor and taste to the curry. 1. Marinate chicken with marination ingredients and set aside for atleast 45 mins in the refrigerator. 2. Heat a pan with oil; add curry leaves &the dry spices and sauté till you get an aroma. usually takes a minute. 3. Add green chili, onions, sprinkle salt and fry till the onions are browned (like the brown onions or fried onions for biryani). 4. Add ginger garlic paste and sauté quickly as this tends to burn faster with brown onions (could not take a pic). 5. Add tomatoes and sprinkle some salt and turmeric and fry on medium high till the tomatoes turn mushy and begin to leave the oil. 6. Add chicken and fry on medium high heat till the chicken become white, takes around 2 minutes. 7. Add red chili powder and fry for a minute. 8. Add garam masala, mix and sauté for a minute. 9. Pour the coconut milk and poppy seeds mix, add mint and coriander leaves. 10. Mix well and add little water to adjust the consistency. 11. Cover and cook on a low flame till the chicken is cooked thoroughly & is tender. 12. If the gravy is too thin, cook and evaporate some liquid without closing the pan. Thanks Love for this great opportunity.Hugs dear. Thanks my dear blogger friends for the compliments. your comments are valuable to me. Have a lovely day ahead to both of you. Lovely guest post,the curry looks so delicious. Wao it looks very tasty.I love curry. Much loved by my goodness too. The spices and rest of the ingredients merged in for a fabulous outcome. I am in for it all the way. Yummyilicious and fingerlicking gravy, love to enjoy with a bowl of rice.Full of flavors,beautiful guest post by Swasthi. HI ! You have a nice blog with awesome clicks . I have just started following you and it would be very encouraging if you may follow me back too. lovely curry and happy to follow u..
hai love...i miss this kari smell dear! bestnya kalo i dpt mmg mkn sampai jilat jari! allah make you happy. because you make other people happy. Nice recipe and experience with images i love it. Thanks it helped me alot in preparing the recipe in my home. Then while surfing i found this.Click. i love chicken curry.. once i visit my friend in India his mom made those curry for lunch. it's spicy but i like the taste. I love Indian non veg recipes. especially Andhra chicken curry recipe.this is best combination for Jonna rotte recipe i think so. thanks for sharing. best platform for learners who are trying to learn how to cook it.